Right now, our little preschool co-op group is exploring textures. We’ve danced on contact paper, read and touched some fuzzy/slippery/bumpy/furry books, patted pumpkins, and attempted a few open-ended craft ideas with the little ones. 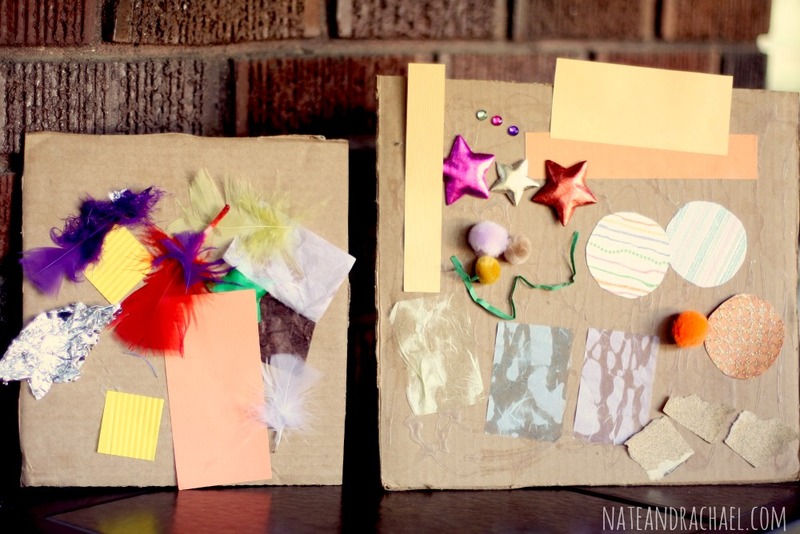 This particular art idea was a huge hit with both the one-year-olds and preschoolers–a texture collage! 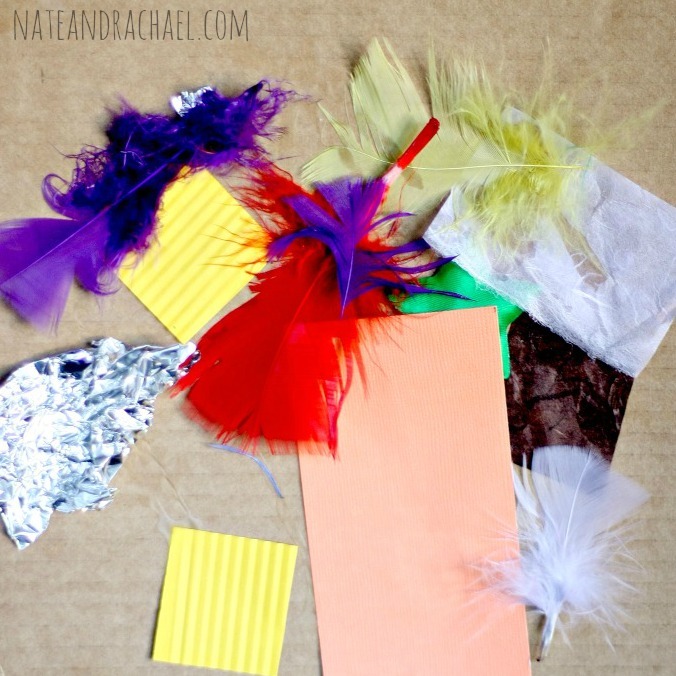 Textures–buttons, gemstones, feathers, pom poms, tissue paper, sandpaper, cut outs of different shapes, and aluminum foil. 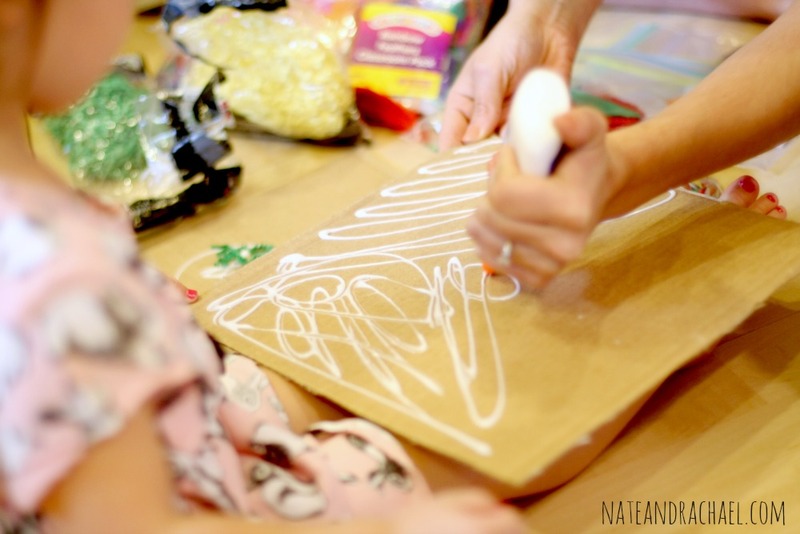 If you’re comfortable with mess, you can encourage your little ones to smear the glue across their cardboard canvas with their hands. Since we were inside someone’s kitchen and working with a variety of ages, we chose to have a mom distribute the glue. Even so, my oldest daughter (age 3) was obsessed with the little bit of glue that dried on her hand. We haven’t played with glue much, which might explain her fascination. But hey! It’s relevant! Dried glue is, admittedly, a very interesting texture to explore. 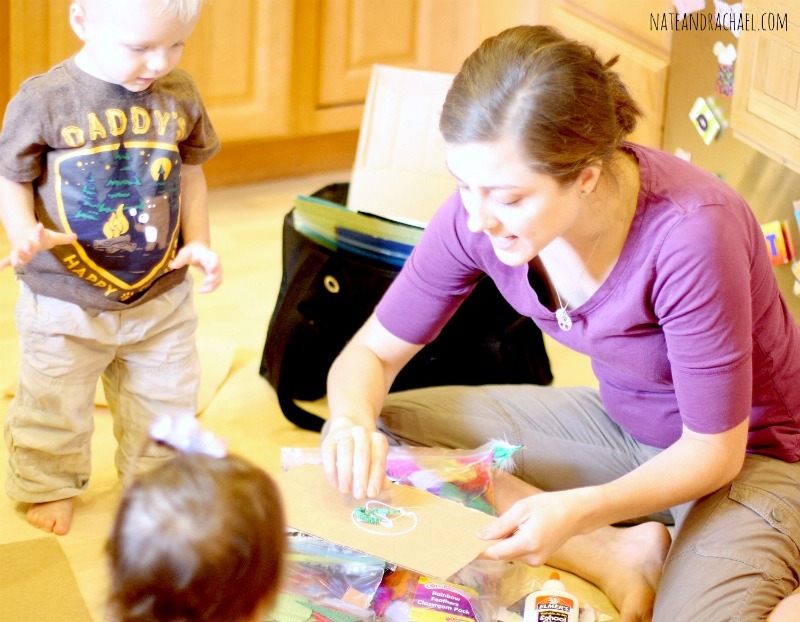 Once the cardboard canvas has been thoroughly covered in glue, let your little ones decorate to their heart’s content. For the babies and one-year-olds in our group, we cheered as they haphazardly stuck different pieces in random places. We talked about the textures and colors, tickled them with feathers, and offered them different pieces to add to their creation. And yes, I realize that this one picture looks like the grown-ups did the work. We did a little demonstration, but the kids owned this project. (And, yes, we supervised closely. My little one thinks it’s HILARIOUS to put things she shouldn’t in her mouth. She loves to see our reaction!) Since my older daughter just turned three, we encouraged her to add three of each piece to her collage. This was process-based art, which means we were more concerned with HOW they explored than WHAT they made. Nevertheless, the finished products are proudly on display at our house. For a fun variation, one of our friends used circular pieces of cardboard to turn this little project into a group activity for her son’s ball-themed first birthday party. Cute! For more info about how to start a simple and fun homeschool preschool, check out our “Starting a Homeschool Preschool” post! If you’d like to read more kids’ activity ideas and family travel tips, we’d love for you to follow our blog on pinterest, subscribe by email, and/or join the conversation on the Nothing if Not Intentional facebook page!